Take 1 tablet daily preferably with a meal or as directed by a healthcare professional. 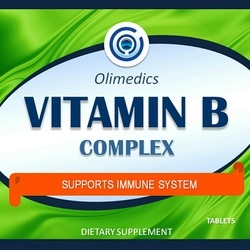 Active ingredients: Vitamin B-1, Vitamin B-2, Niacin, Vitamin B-6, Folic Acid, Vitamin B-12, Biotin, Pantothenic Acid, Choline Bitartrate, Inositol, and PABA. Other ingredients: Calcium carbonate, vegetable stearic acid, croscarmellose sodium, vegetable magnesium stearate, hydroxypropyl methylcellulose, silicon dioxide, watercress powder and parsley leaf powder.